First off, the dough tasted pretty good on its own, before being baked. And we all know that’s one of the first things we do with cookie dough, right? This was pretty tasty and not grainy at all. I heated up the oven, scooped eight little cookie piles on the cookie sheet and waited about 10 minutes while they baked. Since I made mine a bit smaller than suggested (I like little cookie bites), it took a little less time than suggested on the package. I tried to wait a few minutes for them to cool off, but you and I both know that wasn’t going to last long. The final analysis…YUM! I only made eight and I was glad of that only because I think I would have eaten more if I made more. I ate three and my husband and daughter finished them up quickly. They are chewy on the inside and slightly crispy on the outside. They browned up just right and had a wonderful texture, which is always a bit of a challenge when we’re talking about GF cookies. They had just the right amount of chips, which means these are quite welcome in my home. Advantages include the option to make a few at a time since it’s in a tub, and you can make them when you please. They are tasty and not overly sweet (as if a cookie could be too sweet.) Disadvantages include the cost ($5.49) and the fact that I have had better cookies, but not this easy and right out of the oven. If you’ve got kids and/or friends who may want a few cookies, this is the ticket. My husband, who is not GF, asked me to make more. And as far as cost goes, I think using a small scoop means you’ll get a lot of cookies for the money. 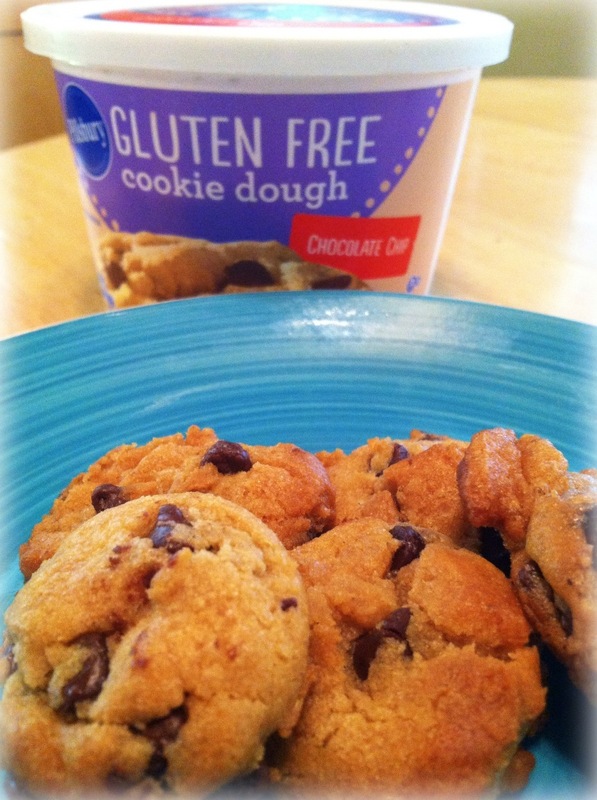 I bought the Pillsbury pizza dough, which is also gluten free, to try next week. At the same price ($5.49) I hope it makes a pretty decent-sized pizza. Stay tuned for that one. Next up, I’ll be scooping some of that cookie dough into a skillet, baking halfway and topping that with a bit of ice cream. What? It’s my birthday… Who’s joining me?